How do you graph the evolution of a laugh? Researchers tickled babies and six different kinds of apes, quantified their giggles, and found that the patterns fit a classic evolutionary tree. 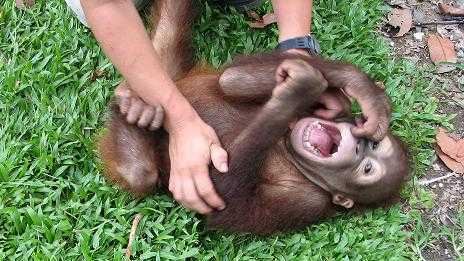 An orangutan named Naru vocalizes during a tickling session. Those patterns hint at the ancient origins of human hilarity and suggest that other social species - including apes, dogs and rats - really, truly laugh as well. "What we can say is that laughter goes back at least 10 to 16 million years," said University of Portsmouth primatologist Marina Davila Ross, one of the researchers behind the study published online today in the journal Current Biology. "It could go farther than that." A prominent researcher in the specialized field of animal laughter, Jaak Panksepp of Washington State University, said it definitely goes farther back than that. "I personally think that a credible laughter concept can, and already has been, extended to mammalian species as lowly as the rat," he told me in an e-mail. For years, Panksepp and his colleagues have been documenting the high-pitched vocalizations that rats make when they're tickled by human handlers - and they insist that such vocalizations reflect "laughter and social joy." But some skeptics have said it's too much of a stretch to classify those sounds as true laughter. The research conducted by Davila Ross and her colleagues - Georgia State University's Michael Owren and Elke Zimmermann of the University of Veterinary Medicine in Hannover, Germany - appears to support the case for animal laughter. The scientists charted a spectrum of tickle-induced vocalizations from three human infants and four species of great apes in captivity, plus the less closely related siamang ape. Eleven auditory variables were measured for the 25 experimental subjects - variables such as the length of the vocalization, the in-and-out breathing patterns and the vibrations of the vocal cords. All those numbers were fed into a software program that looked for relationships between the data points. Then the computer constructed a phylogenetic tree (that is, the "family tree") that fit the data best. The resulting tree turned out to reflect the widely accepted evolutionary relationships between the species. The siamang was way out on its own branch. Chimpanzees and bonobos were closely related to each other, and to humans. Gorillas branched out a bit lower on the tree, and orangutans were lower still. "It's an interesting pattern," Davila Ross said. The human babies had a distinctive pattern of laughter: a haa-haa-haa, with regular voicing, on the exhale only. But the researchers could see the roots of that pattern in the chimp vocalizations: typically, a fast hee-uh-hee-uh-hee, using an in-and-out airflow. The researchers were surprised to find that some of the apes could extend their exhalation to as long as 10 seconds during laughter. "That's something that was thought to be present only in humans," Davila Ross said. "It's certainly an important part of speech - that we can produce a continuous vocal flow without having to stop, inhale, and say a few more words again." In their Current Biology paper, the researchers say "one can conclude that it is appropriate to consider 'laughter' to be a cross-species phenomenon, and that it is therefore not anthropomorphic to use this term for tickling-induced vocalizations produced by the great apes." Panksepp said the paper "provides a minimalist, highly conservative interpretation of the exciting findings." He's been focusing on rats, but other research suggests that dogs make a particular kind of pant that could be considered laughter. The "dog-laugh" accompanies play behavior, and when other dogs hear the sound, it appears to reduce stress (like a good joke among humans). One of Panksepp's research colleagues, Northwestern University's Jeffrey Burgdorf, said rat laughs seem to have a similar effect ... on rats, that is. "These animals like to hear them," he told me. "They press a bar to hear these vocalizations. ... Every time they vocalize, it's rewarding to them." Burgdorf sees the evidence of that in the rats' neurochemical response as well. Laughing, or even hearing laughter, leads to the release of dopamine and opiates that make the brain feel good. The more socially oriented a species is, the more likely it is to exhibit laughter (or, more technically, vocalizations associated with tickling or play). Rats laugh, but not mice. "Mice are solitary creatures," Burgdorf said. OK, so what about cats? Could purring be considered laughter? "My gut says that it is, but you can't show it empirically," Burgdorf said. If researchers find that a cat's purr is associated with the brain's feel-good chemicals, that might support the case for feline laughter. But really, the bottom line is that there's a wide spectrum of vocalizations linked to animal pleasures. "Invertebrates make vocalizations, but they don't have neuroanatomical homology to humans," said Burgdorf, sounding thoroughly like the neuroscientist he is. Translation: Just because a bee buzzes, that doesn't mean it's laughing at you. The latest research doesn't speculate on what drove the evolution of laughter. "It could be that there are social factors that have had an impact on evolution," Davila Ross said. "There could be side effects of the evolution of vocalization and speech." The apes were recorded during tickling sessions at seven European zoos, and Davila Ross acknowledged that laughter in the wild could be different from laughter in captivity. "Even if you compare one zoo group with another zoo group, there are differences," she said. But the researchers tried to minimize the potential for human influence by tickling infants and juveniles rather than adult apes. Vocalizations associated with pleasure could serve as positive signals to other members of the species during social interactions. "It probably came from mating vocalizations, which are examples of positive social interactions," Burgdorf said. Burgdorf said he's interested in laughter not so much to find out how it evolved, but to find out how it can heal. If there's a link between particular types of vocalizations and the neurochemistry of feeling good, then animal studies could lead to better mood-lightening medicines. Studying animal laughter certainly lightened the mood of Davila Ross and her colleagues: "When watching the apes play with the caretakers, it was contagious," she said.